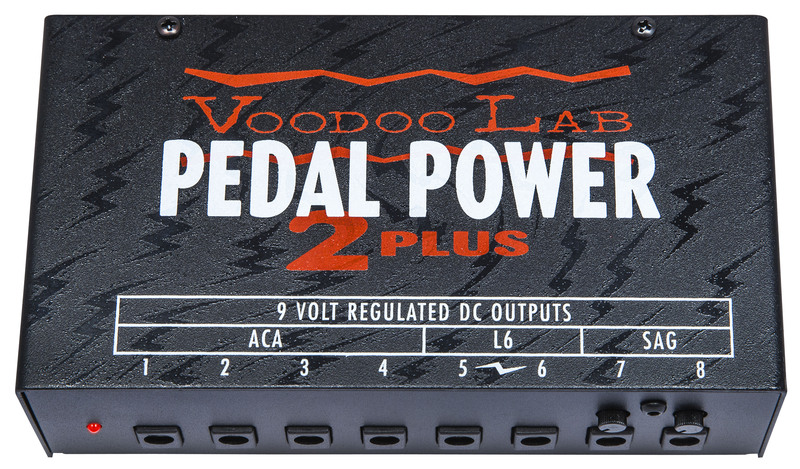 Pedal Power 2 Plus, AC Adapters for Pedal from Voodoo Lab in the Pedal Power series. 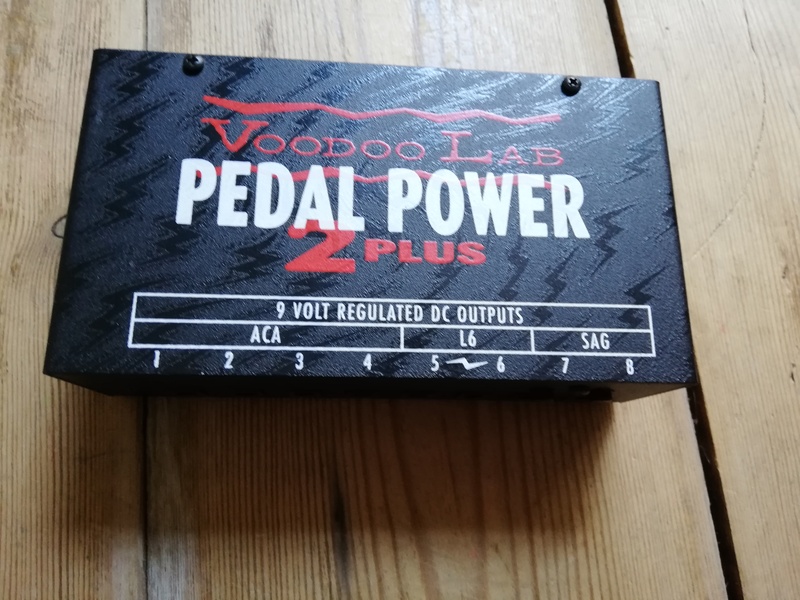 stompboxjon's review"Quiet, A must have"
The Voodoo Lab Pedal Power 2 Plus is a power supply that can take up to 8 different effects pedals. It only cost around 150 dollars, and it has short circuit protection from burn outs and all the outputs are isolated. It is very quite with low noise and provides a lot of power for a little device. It will only take a few minutes to set up your Power 2 Plus and have it running, I am extremely happy to use this and it has become one of the best smaller purchases that I have made for our band. I have tried many other similar power supplies but none from Voodoo, I was really surprised with how well built the Power 2 Plus actually is. For the price of it I expected to get something a lot cheaper built. 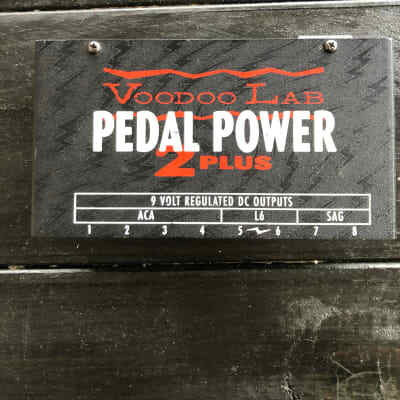 The short circuit protection on the Voodoo Lab Pedal Power 2 is a must have for us because from time to time some of our pedals may have some sort of an issue, but on this device if there is an issue the Pedal Power 2 Plus will automatically shut of for a while to make sure the unit doesn’t get damaged. There are no interactions between pedals because everything is isolated, the power supply for each pedal will not be the same which keeps everything separate and running seamlessly. 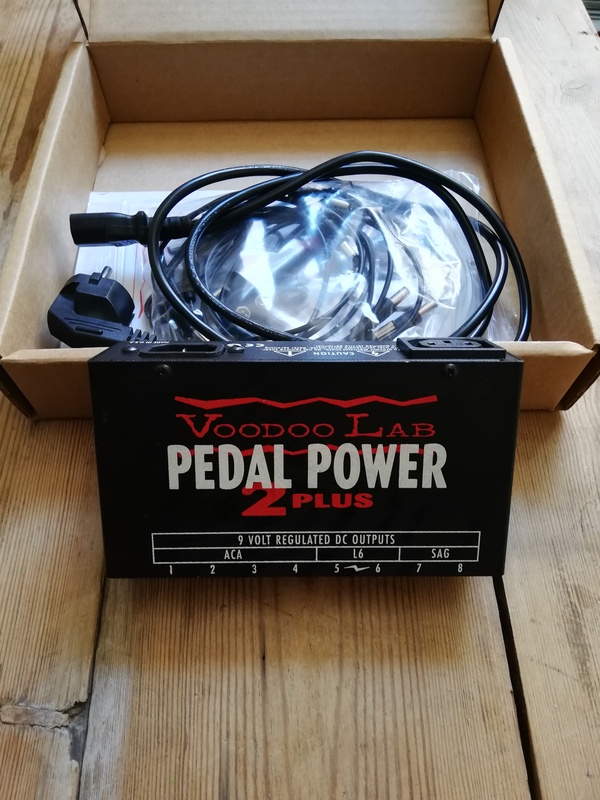 The Voodoo Lab Pedal Power 2 comes with more cords than I expected, it has right angle connectors , straight connectors , the 9v battery and a few other cords. It comes with everything you need to just plug in and play and not have to worry about reading manuals or trouble shooting. It is very easy to use and it will last you a lifetime! I recommend this to anyone that is a guitar player, you will need to add this to your set up and let it power your pedals. It is very quite and will remove your ground noise. wwhhhaatt's review"Best investment for a pedal board"
This one of the most valued pieces of gear I have. There are other power supplies out there with the ability to power pedals with different demands but the pedal power is perfect for probably 90% of the effects pedal users out there. It provides clean isolated and filtered power through eight individual outputs all packaged in a tough little box. I previously used the Dunlop DC brick which is great for a few pedals but once you start using an effects loop or a wide variety of pedals it can get noisy. All the output taps put out 9volts but can also be changed via dip switches to accommodate other power requirements. -taps 1 through 4 can be set to power the older boss ACA pedals which I believe are 12v. -taps 7 and 8 have sag controls to simulate the effect that a dying battery would have on a pedal. I've used mine to power a board full of pedals without issue. By using daisy chains to hook multiple low current drawing pedals to one output you can easily power more than 8 pedals. This works great for simple boxes but it is best to keep digital pedals, especially delays, on a dedicated output to avoid any issues from under powering. There are also many different types of coupling cables you can buy if you need to power pedals with different voltage requirements. You can combine two of the 9volts to get 18v or flip the dip switches and get 24v for things like the electro-harmonix memory man. The added courtesy out on the back allows you to plug in a wall wart if you have anything that needs AC power. This box will keep your pedal board tidy and as noise free as it can get. nickname009's review"the go-to power supply!!!" 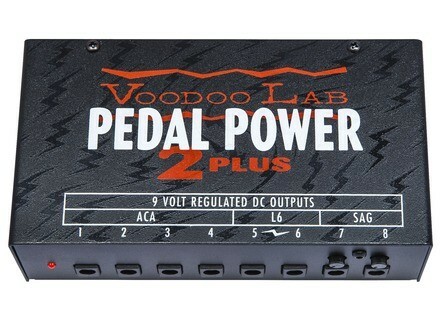 The voodoo lab pedal power has been one of if not the most famed power supply out there today. For many reasons, it works, and the support is great! I misplaced one or two of the provided cables and emailed their support, they mailed me one for free and I got it in the next week or so! Awesome! I've owned this when I had a semi medium-sized board to power everything. I ended up using every output and even the AC plug to power an extra pedal. My pedals have never stopped working or fried out on me. Though I've heard many worse stories with other supplies. It's also a decent size, not too big, though of course, if they can ever make them smaller, I wouldn't complain! I have never experienced any excessive noise though I don't notice it being quieter either. Ground loops and hum is not an issue of course. One thing, DO read the manual if you need to power anything in a special or unique or complex way!!! Make sure you plug the cables using the right ends for each input/output etc! I was lucky enough that I went after simple boss-like pedals and just one or two oddball pedals. I've now simplified my pedal rig down to 3 or 4, of which use their own power supply or require nearly nothing to power. I'm trying to go boardless if possible and thus sold off the PP2. But if I ever had to build another board, the PP2 would be the one to power'em all! I'd much prefer this over any other power supply for the price. It's decently priced and well worth it! <p style="margin: 0.0px 0.0px 0.0px 0.0px; font: 10.0px Verdana;">What thing do you like most/least about it? <p style="margin: 0.0px 0.0px 0.0px 0.0px; font: 10.0px Verdana;"><span style="white-space: pre;"> </span>I've had my fair share of power supply issues in my time. My new favorite is this Pedal Power 2 Plus, simply because its the best PS I've found for reducing noise. This power supply is capable of powering up to 8 9-or-12V pedals at once, and it isolates each one so that there is no buildup of noise. I've never been able to get the right combination of effects without having too much noise or hum in my sound. I also really like the fact that you can switch from 9V to 12V for each input, which makes things incredible easy and ideal if you are using various pedals. I also enjoy some of the finer controls that the pedal offers. 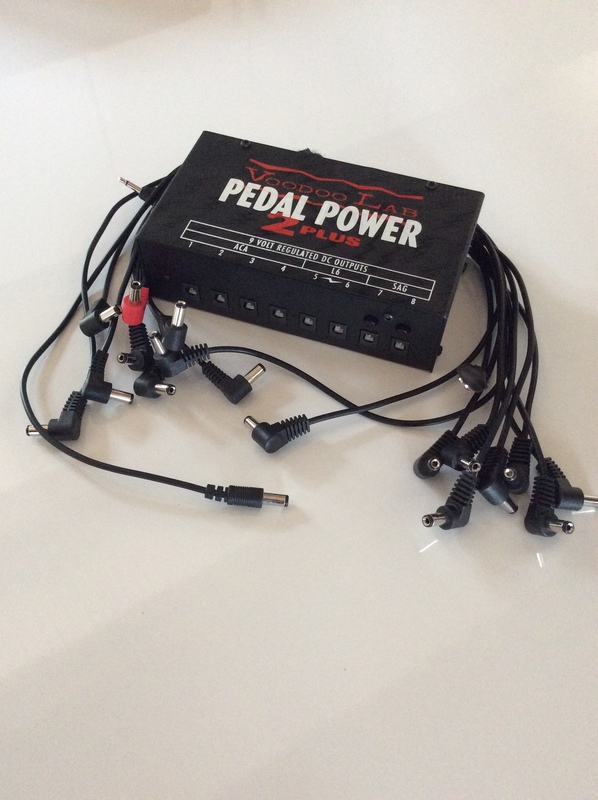 For instance, if you need high current to power a pedal, you can set the Pedal Power 2 to deliver that. It also has a nice SAG feature, which I don't fully understand, but I can tell that It allows some pedals to be dampened. From what I've gathered it allows you to decrease the voltage for pedals. It doesn't work well for everything but my fuzz pedal sounds great sometimes when I need it to back off a bit. 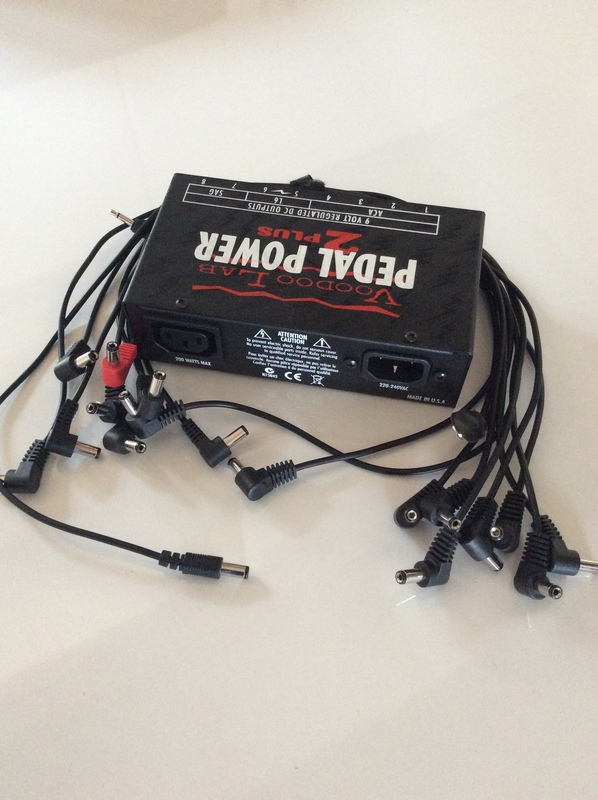 Although I've never been able to do it since I don't have the appropriate pedals, the Pedal Power 2 plus also has the option of powering 18V and 24V devices as well, though this requires some extra cables. <p style="margin: 0.0px 0.0px 0.0px 0.0px; font: 10.0px Verdana;">Did you try many other models before getting this one? <p style="margin: 0.0px 0.0px 0.0px 0.0px; font: 10.0px Verdana;">I used to have to limit myself not only to Boss pedals, but to 9V ones at that, to avoid making noise (and so that I could daisy-chain the pedals and therefore only have to use one power supply). This makes that problem nonexistant. This is a better product than anything I've tried. <p style="margin: 0.0px 0.0px 0.0px 0.0px; font: 10.0px Verdana;">What is your opinion about the value for the price? <p style="margin: 0.0px 0.0px 0.0px 0.0px; font: 10.0px Verdana;">I would absolutely recommend this power supply over any other, assuming that one has enough pedals to justify buying it. If you're only using one or two pedals, it might not be ideal. <p style="margin: 0.0px 0.0px 0.0px 0.0px; font: 10.0px Verdana;">Precision and quality of the sound? <p style="margin: 0.0px 0.0px 0.0px 0.0px; font: 10.0px Verdana;">I think the best thing about this supply is that each pedal sounds virtually the same as it would if it was the only pedal that was plugged in. This is rare among pedals that share power supplies. Therefore that's the best way to describe the quality of the sound, which is only as good as the sound of the pedals you are using (as well as the amp and guitar/bass).